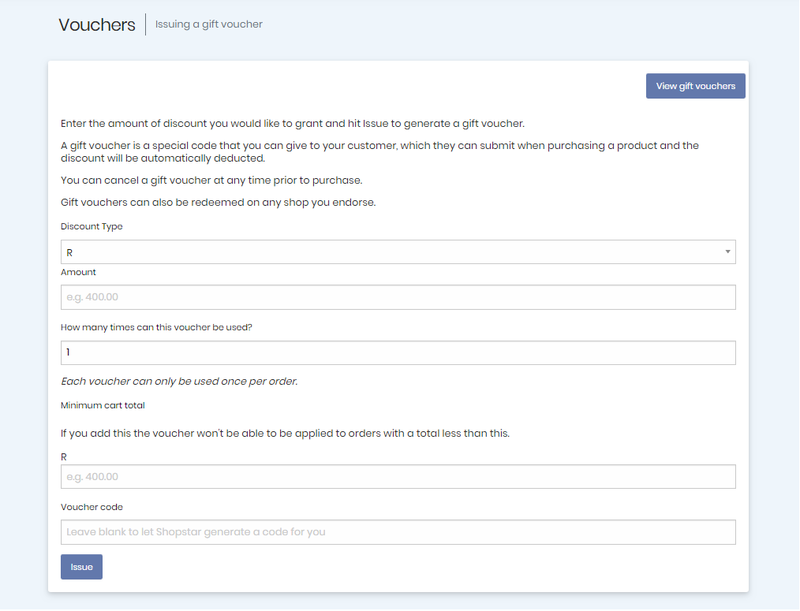 Under Products >> Voucher, you can create a gift voucher for your customers. A voucher is a special code that you can give to your customers, which they can submit when purchasing a product from your shop and the discount will be deducted automatically. You can cancel a voucher at any time prior to purchase. You can create individual vouchers as well as one voucher number with the same value multiple times. Add how many times the voucher can be used (each voucher can only be used once per order). To view issued voucher numbers or deactivate vouchers: go to your admin section. Here you will see an overview of your voucher codes and an option to cancel them. You can also click on ‘Voucher Redemptions’ and see who has used which voucher code etc. You can also choose to sell a voucher - like a product. See this example on Veltwerk's shop. Just create an image and sell these gift vouchers.